Locally, regionally, nationally, and internationally, most of us live under the threat of escalating crises concerning the availability of freshwater; this isn’t going away. We’re investing in this challenge via companies with global reach that offer industrial and municipal-level services in the areas of measurement, control, development, and treatment. Suez and Veolia are the clear favorites; IBM has dark horse potential to become a partner with them and governments in monitoring freshwater supply and demand. Finally, I’ve mustered the gumption to write an article about a topic that interests me dearly - freshwater. However, before diving in, let’s pause to remember that this life-sustaining resource comes from five sources: 1) the sky as the ultimate distiller, 2) above-ground streams and rivers, 3) liquid and frozen “basins”, including reservoirs, lakes, oceans, and glaciers / snowpack, 4) below-ground stores as in aquifers, and 5) recycled water, brackish or polluted but available for reuse if properly treated. The problem, of course, is that in most areas of the world, the demand for freshwater - by people, farms, and industry - exceeds supply or soon will. The internet is replete with information on this topic as in this 2017 piece by the BBC reporting that global demand for freshwater is expected to grow 55% over the half century 2000-2050. Of the world’s 37 major aquifers, 21 are being depleted, and 13 are under serious stress. Conserve with techniques such as aeration, and drip irrigation systems that are estimated to use 30-70% less freshwater. Access previously untapped sources of freshwater as, for example, the Mojave aquifer. Create more freshwater through distillation or reverse osmosis (RO), electrodialysis (ED), thermal, or multi-stage flash desalination recognizing that the largest RO plant in North America in Carlsbad, California, while delivering 50 million gallons each day, meets not quite 10% of San Diego County’s need. Recycle as much H2O as realistically feasible, including non-potable water for use in parks and on golf courses. Share and allocate what freshwater “remains” according to agreed / mandated priorities, while remembering, for example, that almost nothing of Colorado River reaches the Sea of Cortez. “You can’t control what you can’t measure.” Tom DeMarco, et al. In the US at least, there are huge data sets concerning freshwater creation and usage. They are captured through a variety of techniques and consolidated by the National Oceanic and Atmospheric Administration / NOAA as to precipitation statistics and the United States Geological Survey / USGS as to surface water and aquifer levels. But there is work to do to “translate” these and other data such that freshwater policy makers, suppliers, and users can plan and respond appropriately. Such tools and interactions are a good thing. Dating back decades, the irrigators we bought were fitted - as all were then - with flipper-type sprinklers that, in our case, could deliver an inch of water over 24 hours from 16” wells fitted with diesel-powered pumps. At the end of each of our booms was a “gun” or fire hose nozzle that threw water out another 50-100’ - all extremely wasteful. We subsequently replaced all that with drip heads that were just as effective, while conserving a lot of groundwater. Colorado requires similar systems. But cross the border into Utah and you will see the old-fashioned irrigators and evidence of other practices that overly stress freshwater resources, including those that would be available for others downstream of the state’s rivers. Responsible governments rely on these data to inform freshwater policy and initiate projects with the help of the private sector. And here, the big dogs are Suez Environnement (OTCPK:SZEVY) and Veolia Environnement (OTCPK:VEOEY). The histories of these two transnational French companies date back to the mid-1800s, when Suez was involved in constructing its namesake canal connecting the Mediterranean and Red Seas, and Veolia was founded as the “Compagnie Generale des Eaux” to deliver freshwater required for urbanization. Suez’s position was strengthened two years ago with the acquisition of GE Water & Process Technologies. These two companies are known less for their products and more for their services, with the expertise to be general contractors / integrators. Suez’s website is neatly organized - just as one would expect of a company with roots in engineering. It breaks down its solutions for local authorities and businesses along the lines of production, distribution, recovery, reuse, and so forth. Veolia’s portal is not quite as crisp but contains ample detail of its capabilities. Both companies emphasize their commitment to sustainability, especially in the treatment of wastes in various forms - runoff, sewage, and organic refuse. This puts them in the center of the “circular economy”, wherein byproducts of their processing are used for other purposes such as energy generation. Note here Suez’s alliance with its former parent, ENGIE (OTCPK:ENGIY), that continues to hold a third of its shares. Given the magnitude of our freshwater challenges, bigger is better, and Suez and Veolia dwarf all others in this space. 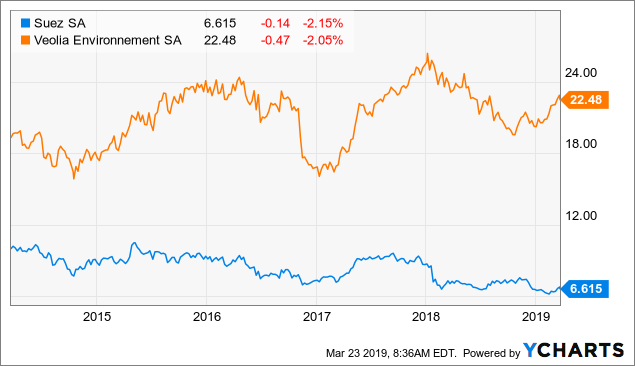 With $20 billion and $30 billion, respectively, in annual revenues, they are well out ahead of fine firms as American Water Works (AWK), Ecolab (ECL), ITT Inc. (ITT), and Pentair (PNR). There are things not to like about Suez and Veolia financially, notably their debt / leverage. However, low interest rates should help in this capital-intensive business. In addition, both Suez and Veolia are again growing their top and bottom lines, and there is a hint that their ADRs are beginning to arc up. Schwab has SZEVY as an “Underperform / Hold” and VEOEY as an “Outperform / Buy”. I’ll end this piece with a retrospective on two other articles I wrote for SA. The first appeared in early 2016 and was entitled “Investing Begins At The World Economic Forum”. I led off that piece by pointing readers to the “Global Risks” assessment that the public and private sector members of that esteemed group contribute to before their annual meeting in Davos. The 2019 refresh of that assessment appears here. Now, as then, the crisis with freshwater ranks among a handful of risks that are viewed as being especially serious both in terms of likelihood and impact. “Failure of climate-change mitigation and adaptation” ranks as even more critical, an area where the companies mentioned above are also active. As for the second article, SA published it just a few months ago: “Looking Through 2019 To The 2020’s; 4 Major Themes”. Here, I argued that the investment landscape in the decade ahead is being shaped now by work in the areas of renewable energy, blockchain, crop-based agribusiness, and robotics/AI aka, “motion”. For the reasons explored above, freshwater investing also deserves a place within any forward-looking portfolio. Disclosure: I am/we are long SZEVY, VEOEY, IBM, ENGIY. I wrote this article myself, and it expresses my own opinions. I am not receiving compensation for it (other than from Seeking Alpha). I have no business relationship with any company whose stock is mentioned in this article.